If you’re anything like us, your attempts at early holiday shopping have been foiled by a number of factors, including a) work, b) general procrastination tendencies, and c) your inability to resist buying stuff for yourself when you see a good deal. (We can’t afford not to buy it!) And if you’re also like us, you just realized it’s December and you’re starting to sweat a little. (That new sweater you bought yourself on Cyber Monday is thick.) Well, downtown L.A. has you covered this weekend with two mega marketplaces specializing in food and drink-related giftables. This year, Artisanal L.A. is hosting its holiday market on East Holly Street in Old Pasadena. In addition to its usual, well-curated collection of small-batch goodies like Grist & Toll flours, Three Little Figs jams, and Marco Polo chocolates, the organizers have partnered with a number of the area’s small businesses, restaurants, and cafes, making for a whole neighborhood’s worth of shopping (and nibbling) options. Bonus: Word has it Santa will be there—he’s always a hit with the kiddos. All this weekend, the new and very much improved Grand Central Market will be the downtown epicenter of foodie retail therapy. Hedley & Bennet will be selling their top-of-the line, locally made aprons, Rachel Narins of Chicks With Knives will be selling her pickles, and local millers Grist & Toll will be offering flour and bread-making tools. 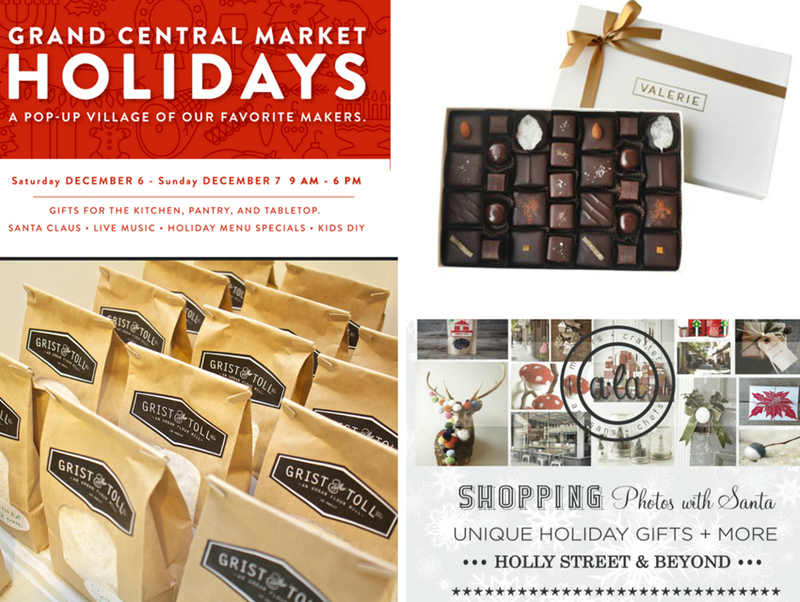 In addition, a slew of vendors will be participating with their own holiday specials, and Valerie at CCM will be displaying fancy holiday-themed fruitcakes, chocolate boxes, and peppermint bark. The chocolatier is also hosting a “Ladies in the Kitchen” cookbook signing event with chefs such as Aarti Sequiera of Aarti Paarti, Catherine McCord of Weelicious, Akasha Richmond of Akasha restaurant, Amelia Saltsman of the Santa Monica Farmers’ Market Cookbook, and Valerie Gordon herself, who released Sweet last fall. And for the kdidos? Ornament decorating with Little Junebugs, and an appearance from Mr. Claus, himself. (He gets around).